Spring may be over but soft spring shades are always a win in my book. 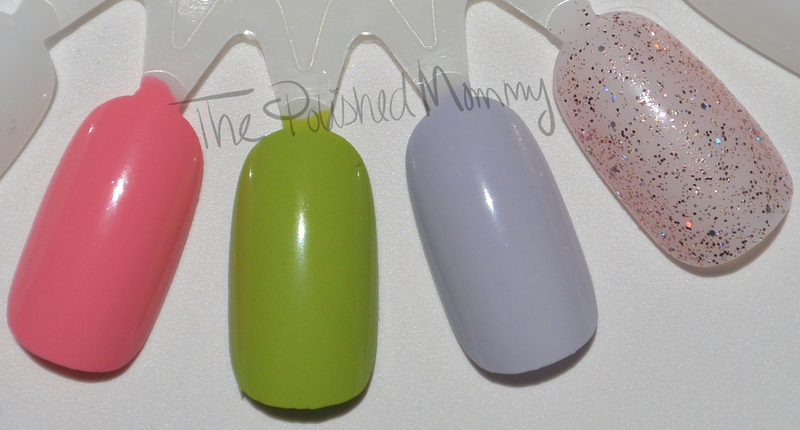 And these popular shades from Pure Ice were just begging to be used for a spring floral mani. Lucky You! 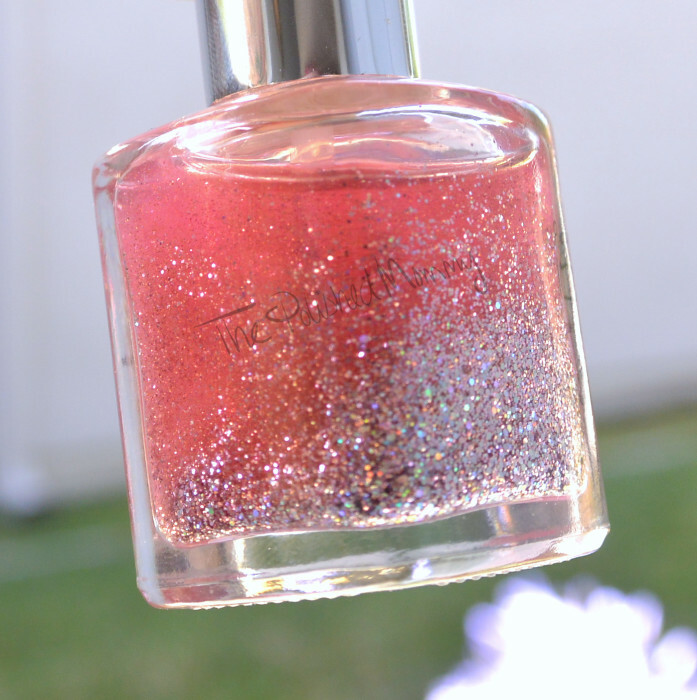 is a light pink creme with a thin easy to apply formula, two coats gives you full opaque coverage. Wild Thing is a yellow-green creme, opaque in two coats. Laven-dare Lilaclism is a soft pale lavender. Applies on the sheer side and needs 3 coats for full opaque coverage, has slight patching at 2 coats. Almost all of the glitter sinks to the bottom, and even with a really good shaking doesn’t re-suspend. I needed to stir it with an orangewood stick in order to get the glitters to fully mix back into the base. I create this look with 3 coats of Laven-dare Lilaclism as a base color, then used Luck You!, Laven-dare Lilaclism, Spitfire, and Wild thing to make the roses. The accent nail has a base color of Sally Hansen OMGhost and a watermarble using Wild thing, Luck You! and Laven-dare Lilaclism. Then I stamped it with MM42 using B Polished Midnight in Death Valley (launching soon!) and added some sparkle using Spitfire. Such a cute mani! It’s a shame about the poor suspension in Spitfire because the glitters in it look so pretty. I’m sure sure that these are shades that I would normally gravitate towards, but you make them look so good in your nail art. The little flowers are adorable! 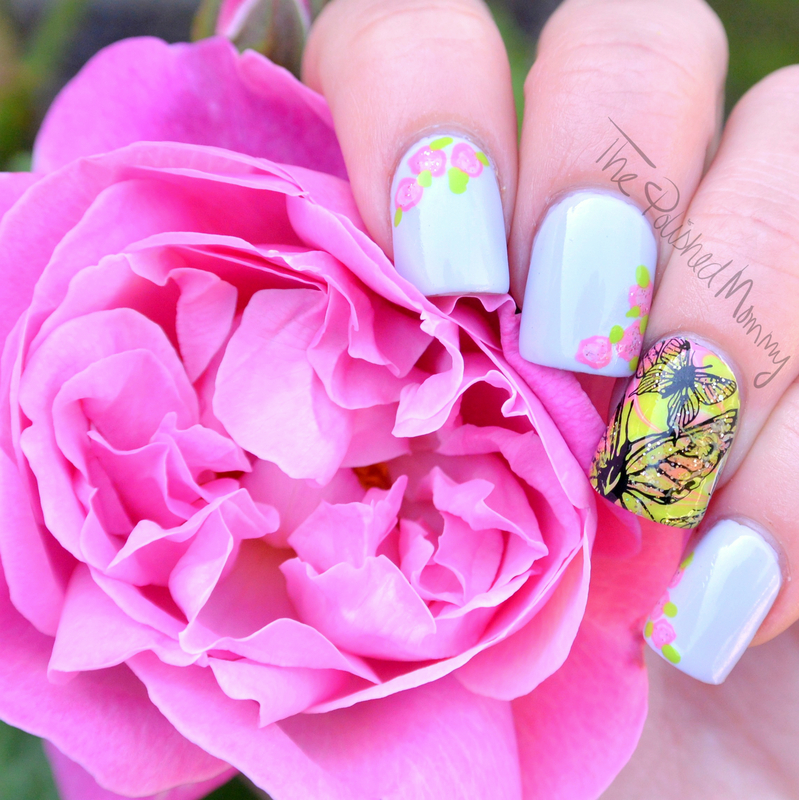 Love love love the butterfly accent nail! You did a beautiful job on it. You put them all together so beautifully! The lilac is perfection though! I love love love the mani you created here! It is simple but stunning. Gorgeous mani. I love how you used them all. Too bad about the sinking glitter. Also, how does this lilacism compare with Essie’s Lilacism I wonder? The Lilacism I have is much paler and dustier than this. Your nail art is stunning! I’ve not noticed any issues with the Pure Ice glitters I have sinking so I’m sad to see yours is giving you trouble. I’m too lazy to stir- I just store upside down for a good 20 minutes before application. Very pretty mani! Too bad about the sinking glitter but you made it work. Oh..I love the lilac shade!